J. V. Görler, I. Lopez-Galilea, L. Mujica, O. Shchyglo, W. Theisen, I. Steinbach. 2D cross sections of a 3D simulation as a function of the relative simulation time where gamma'-phase is shown in blue and gamma-phase in orange. 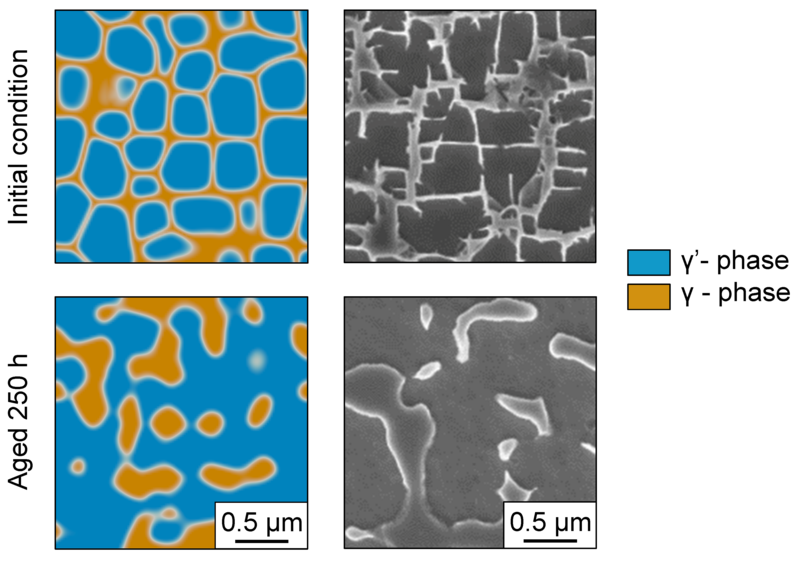 SEM In-Lens detector micrographs showing the evolution of the interdentric area after annealing at 1100°C. Ni-base superalloys are materials which are designed to resist extreme thermal and mechanical conditions. In this regard, an essential factor is their microstructure consisting of gamma' precipitates embedded in a gamma matrix. The application of superalloys at high temperatures can however induce the topological phase inversion, where the gamma'-phase topologically becomes the matrix phase, resulting in subpar material properties. In this work, the topological inversion is analyzed via experiment and phase-field simulation. The evolution of the microstructure has been quantified in the second generation single crystal Ni-base superalloy ERBO/1, which belongs to the family of CMSX-4, submitted to long-term aging at 1100°C for up to 250 h. Phase-field simulations carried out using a multi phase-field approach deliver insight into the microstructure evolution driven by the loss of coherency of the gamma' precipitates, which is induced by the accumulation of dislocations at the gamma/gamma' interfaces. The obtained simulation results are in good agreement with the experimental results, and indicate that the mechanisms causing the topological inversion are linked to the accommodation of the lattice misfit, which enables coalescence and ripening of gamma' precipitates.